Looking for ways to keep the conversation going about LGBTQA issues with your ERG, community group, or PFLAG chapter? 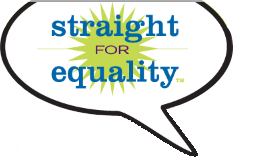 Welcome to Something to Talk About a monthly series designed by PFLAG National’s Straight for Equality program to create conversation about LGBTQA issues. Each month we’ll offer an article on LGBTQA topics and suggest a few questions you can use to lead a discussion. Have you ever encountered individuals who assert that the new language being used in LGBTQ spaces is too politically correct or that people are being too sensitive? If so, how did you respond? Are there any changes you’ve made to create an environment that discourages such assertions? What can allies do to help ensure that more young people, especially those in underserved communities, have access language and information about the complexities of sexual orientation, gender identity, and gender expression? Can you name any resources that might help with this that exist in your community? The author writes about how expansive language is evolving and is new for some people. Can you share an example of a time when you’ve had to push yourself outside of your comfort and/or knowledge zone to demonstrate respect for someone else? What did it feel like? What did you learn?